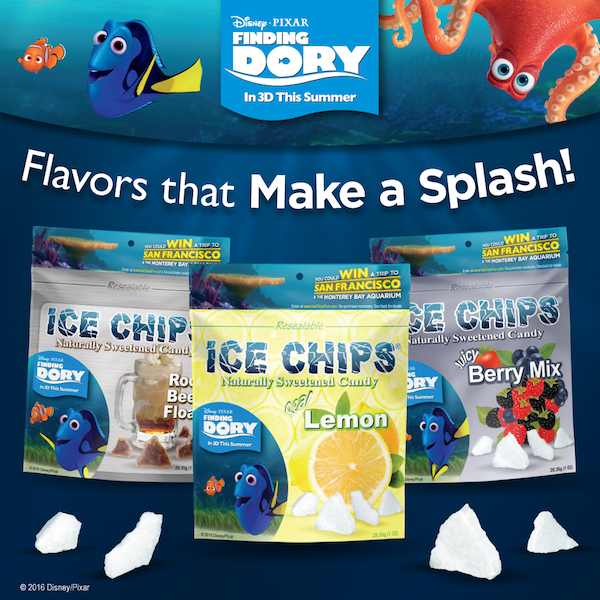 Ice Chips Candy is making a splash this summer with Disney Pixar’s Finding Dory! Finding Dory will be featured on packages of Lemon, Berry Mix, and Root Bear Float Ice Chips, in-store displays, and a national FSI. One lucky Ice Chips fan will also win an amazing Aquarium Adventure prize pack, including a family trip to San Francisco, visits to world famous aquariums, and more! Enter at www.icechipsfun.com before July 30, 2016 for your chance to win. Ice Chips Candy is dedicated to making “Good For You Candy.” Naturally sweetened by non-GMO Xylitol, Ice Chips now comes in 21 mouth-watering flavors using only certified organic and natural flavors. Ice Chips contain no corn, sugar, soy, wheat, or gluten, are great for your teeth, and are safe for diabetics.